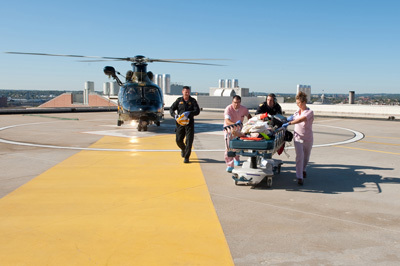 The R Adams Cowley Shock Trauma Center at the University of Maryland is the worldwide leader for traumatic injuries and critical illnesses, as well as research on advanced treatment and prevention methods, and training the next generation of trauma professionals. It forms the core of Maryland’s outstanding Emergency Medical System (EMS) — the first coordinated system in the country and a national model of excellence. Shock Trauma is developing a first-of-its-kind Center for Performance Innovation and Outcomes Management, an organized system that tracks patient demographics, types of injuries and illnesses, and recovery timelines. The Center for Performance Innovation and Outcomes Management will serve as a data source, enabling researchers to track trends and outcomes in patients. Tracking this information is an extremely valuable resource that will lead to new developments in preventative education, prospective studies, improved patient care, and innovative solutions to advance trauma care. Your support is needed to make this initiative a reality, which will ultimately benefit numerous future trauma patients who seek our state-of-the-art care.